They sold most of their real estate starting since the 90s. Sears has a ~$150 million debt payment due tomorrow, It doesn't appear they will make that payment, I'd be surprised if they don't declare bankruptcy prior to market open tomorrow. It was the sears and eatons catalogues that helped settle the country I live in. You could get anything from chicks to a house from them. And in late breaking news, Sears (stock ticker: SHLD) has officially declared Chapter 11 bankruptcy. This doesn't mean they are completely shutting down. It means they have too much debt and will be looking to cut way back on debt. In other words, many (such as owners of the common stock) will likely not get paid. Also, expect additional store closings and people to be laid off. This is the end of an era. I heard on news the past week that Sears would keep some stores open through Holidays while also liquidating stock. The store here has lots of 50% or much more off on stuff. Inventory is thin on some things. ...I'm still sad to see Sears/Kmart shut downs. AGhead wrote: I heard on news the past week that Sears would keep some stores open through Holidays while also liquidating stock. I just now got email from my Sears 'shop ur way' acct. I got 15.00 free cash, 5.00 free cash, also 15.00 off 30.00 in lawn n garden, all in store. Also, they handed me bunch of the same with my register receipt yesterday. I ended up with a big chunk of Sears gift cards after they suddenly banned using GCs to buy their market place gold coins through APMEX. I used a few on some Craftsman stuff, and then told my wife that we had Sears GCs that we probably should spend asap. Now I have very frugal wife who will drive another 5 miles to buy gas 3¢ cheaper, and pours over supermarket coupon flyers to get the absolute best price for the week. And I love her for it. . But telling her that we had GCs that had to be spent quickly - I saw a side of her unknown to me. She had her IPhone, IPad, and the laptop all humming in unison. Using our two Sears accounts simultaneously she managed to spend a little under $400 of GCs on several reasonable items in under 45 minutes. An amazing performance! But she wasn't done yet. She discovered some Sears cash back dollars in my account that I didn't even know existed. When I asked what she was buying after the GCs were used up with rolling eyes she informed me that I would have lost about $40 if she wasn't there to help me. She definitely piled up the points on me today. There is a particular style of Die Hard boots that my son likes for work. He hit the three Sears stores that are within easy driving distance and scored four pairs at 50% off. He's set for the next 6 or 7 years. BotanicusRex wrote: I ended up with a big chunk of Sears gift cards after they suddenly banned using GCs to buy their market place gold coins through APMEX. A good wife makes all the difference in a man's life. Sears is planning to shut 40 more stores next year. This will be in addition to the 142 unprofitable stores the department store chain is already expected to close toward the end of 2018. According to the data at http://www.usdebtclock.org/index.html, American credit card debt alone is over $1 trillion. I was born and raised in Houston, TX. When I was a kid back in the 1960's, and a few weeks after school started, my mom would take me to the Sears in Pasadena, the closest one from our home in SE Houston, to buy a winter coat. The only problem was this was Houston, and September is still hot enough to go swimming at Galveston. I didn't want a coat then, and would tell my mom so. As all of you know, Moms are a lot smarter than we are. Technically, she wasn't buying me that coat in September. She was claiming a coat for me. It was the days when most people didn't own a credit card (or charge card, as they called it), and mom would put the coat on Lay-Away at Sears. Three months later, when it was cooler, Mom would finish the payments and I would have my new jacket. 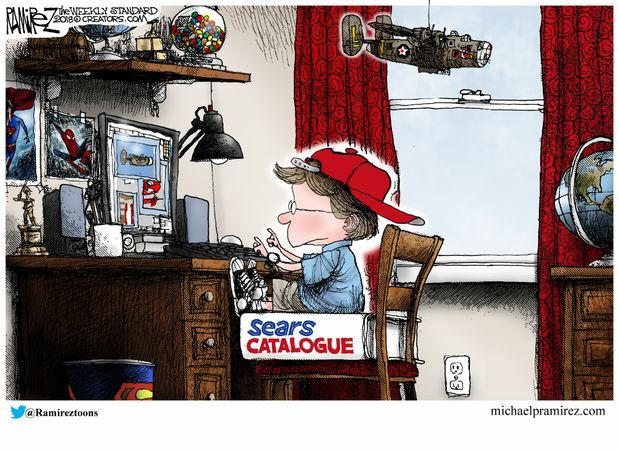 Good ol' Sears and dear ol' mom. I'd like to have her installed as US Secretary of the Treasury. She'd save the country a lot of money and do it with common sense...a much better choice than that felon Steve Mnuchin with his fake Hollywood monster-wife.